Antenna Magus version 3.0 released! We are very proud to announce the third major release of Antenna Magus, Version 3.0. Over the past 3 major releases, Antenna Magus has grown from a nice set of antennas into an indispensible virtual "workshop" for antenna engineers. One of the new features, "Add your own antenna", allows users to add their own antennas to the Antenna Magus database within the familiar Antenna Magus data structure. Once the antenna information has been captured into the database, it is available to use or share (securely) as if it was an Antenna Magus antenna. Now you can use the first knowledge management system specifically designed for antenna designers to manage your own antenna information. Several other features, antennas and utilities have also been added into this release. The antenna database now boasts with 148 antenna topologies that are ready to be searched, designed and exported. 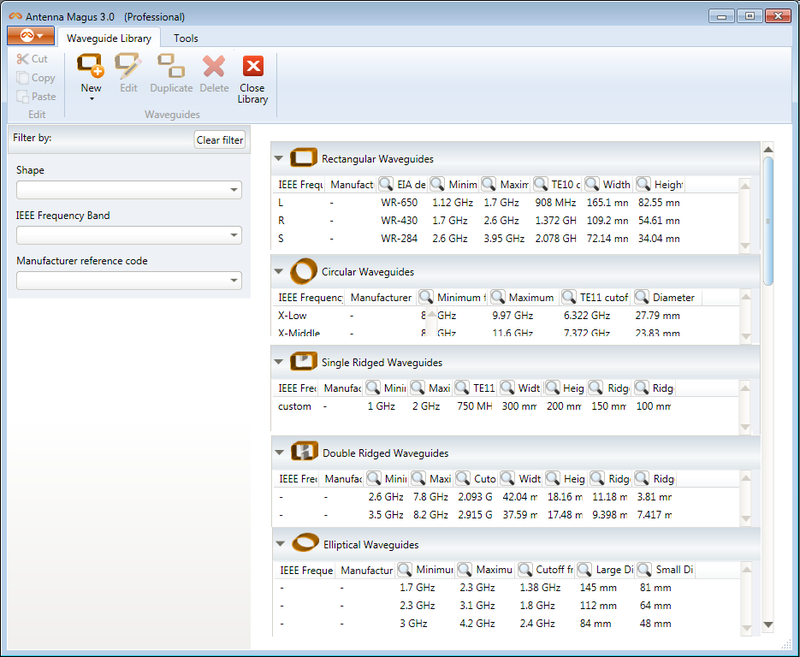 The utilities that have been added to the Antenna Magus toolbox help simplify everyday antenna-design tasks. More detail about the features, utilities and antennas are included in this newsletter. 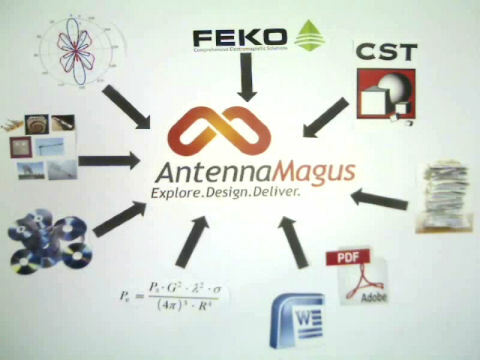 After receiving numerous queries form customers wanting to add their own antennas and designs to the Magus database, it became clear that many people have a need to manage proprietary antenna information in such a way that it is well structured, easily accessible and can be shared amongst colleagues and working groups. 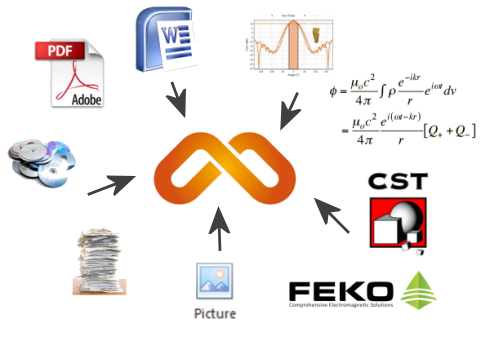 Although various information management systems exist for different types for data (Sharepoint for documents, ITunes for music or Picasa for photos etc. ), there are no information management systems designed specifically for antenna engineers. This has resulted in critical information - representing years of experience and work - being stored in filing cabinets full of papers, on CD's/DVD's or as physical prototypes somewhere in a dusty store room. This knowledge is not very accessible, sharable or easy to manage. In the worst cases, information is never actually captured and only exists as knowledge inside an engineer's head. This means that a company can only retain its IP as long as that engineer is available. 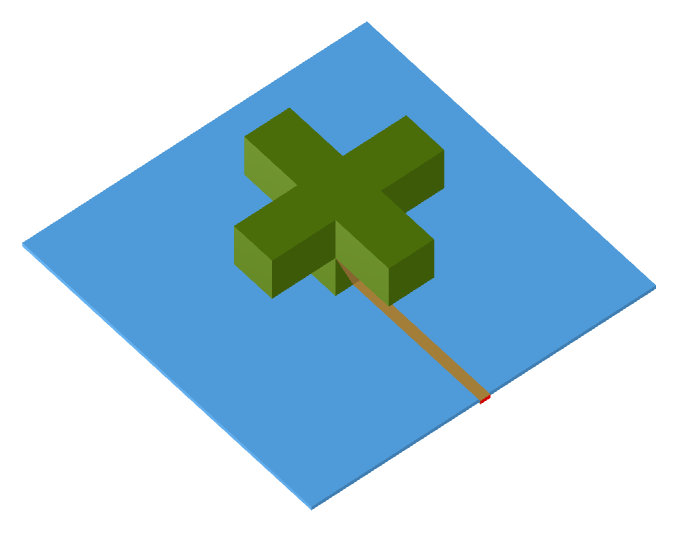 Create and upload information, files and models in custom antenna templates. Consider a toolbox filled with useful utilities selected specifically for antenna engineers. The tools added in version 3.0 help take us a step closer to creating such a toolbox. The chart tracing tool started as an in-house application used by our antenna engineers to read off design values and digitise traces from scanned graphs for comparison (mostly from published papers that were only available in *.pdf or in hardcopy). After realising what a useful tool this is, we decided to include this as a utility in Antenna Magus. Simply select the image or your graph, specify anchor values and follow the trace(s) with your mouse. 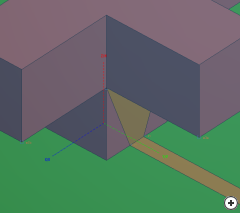 Apply a spline or linear fitting and export the XY values to a TSV (tab separated values) file. Watch the "Antenna Magus Chart tracing" movie to see how nicely it works or download the video here. The substrate library contains an extensive list of commercial substrates and allows for the easy addition of user specified substrates. This eliminates the need to search literature or the internet for suitable substrates for a given antenna element. 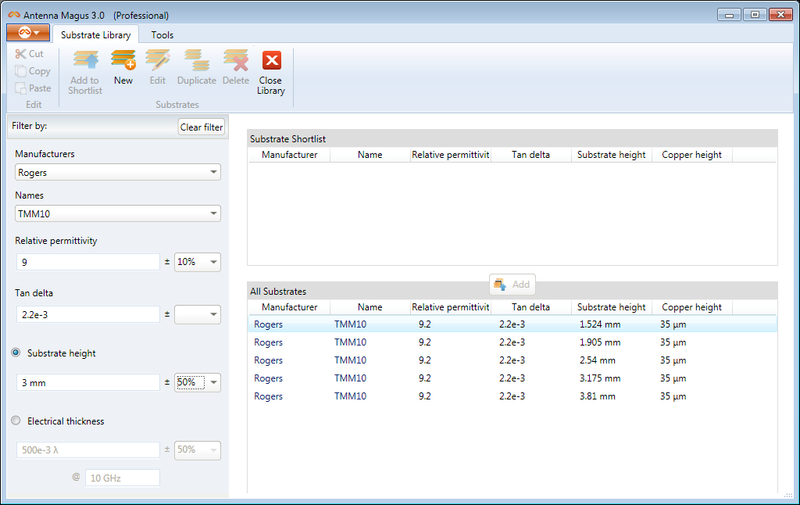 The substrate library is one click away and it conveniently filters the whole database of substrates according to specified physical or electrical properties. 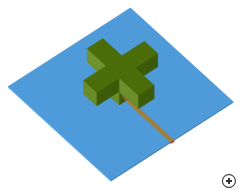 Preview of using the substrate library filter. 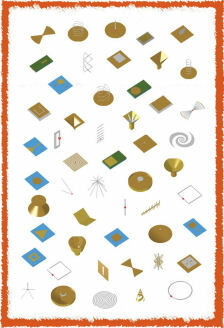 This library is a collection of common designations and standardised waveguide types and sizes. It can be used to easily find the dimensions of a specific designation or to find the electrical characteristics of a standard guide. 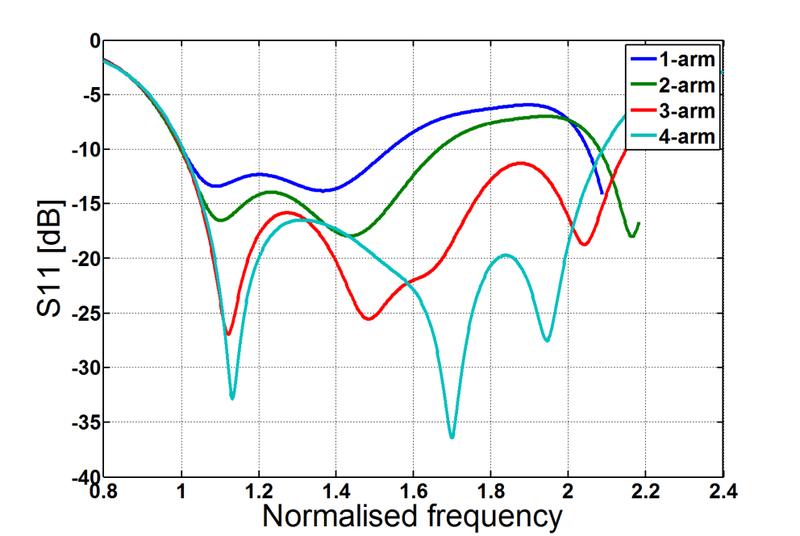 Cut-off frequencies, as well as usage frequency ranges are indicated in the library. 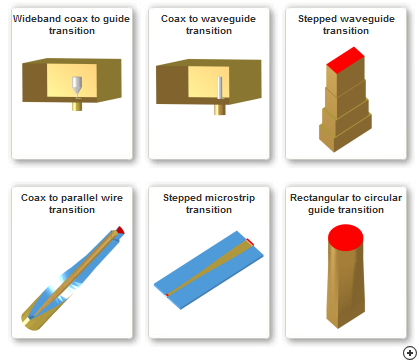 Custom waveguides that may be in use in a company/industry can easily be added to the library for later reference. 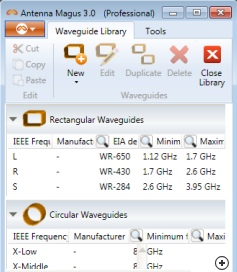 Preview of the new waveguide library in Antenna Magus. 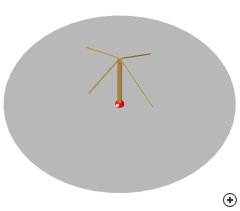 Often antenna design requires the use of a transition from one guiding structure to another (e.g. 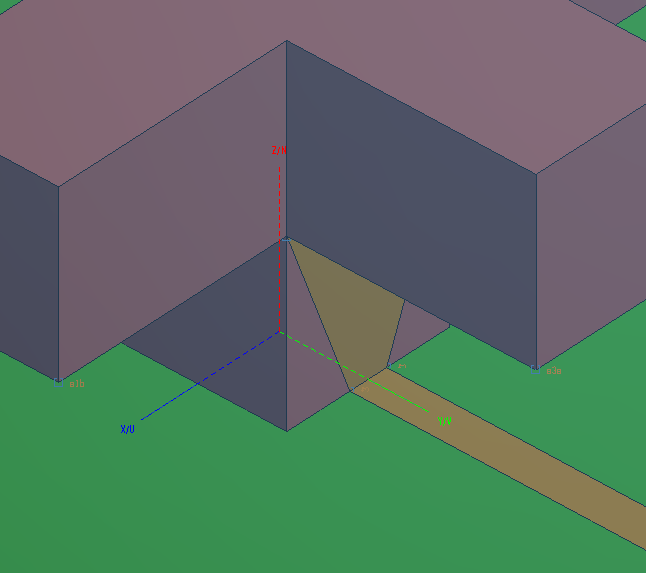 waveguide to coax or circular to rectangular guide) or from one impedance to another within the same guiding structure (an impedance transformer). 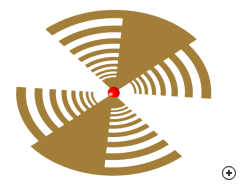 While the main focus of Antenna Magus development is to expand our database of antennas, we have begun to include specific transitions that are useful when working with the antennas in the Antenna Magus database. For Version 3, 7 new transitions have been added to the database. These are shown in the image below - for more detail, please visit www.antennamagus.com/transitions. Click on the image to view all the transitions in the database. Image of the Aperture coupled patch antenna. 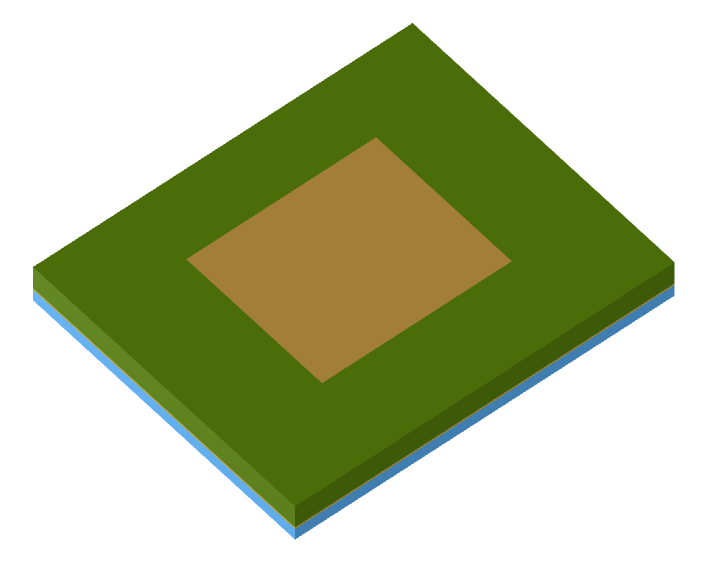 Although the aperture coupled patch is more difficult to design and manufacture, it has a number of advantages over patches with simpler feed-methods. It provides better operational bandwidth, is well suited to direct integration with microstrip circuits and reduces the effects of feed-network radiation when used in an array configuration. The main advantages of this antenna revolve around the separation between the feed network (on the underside of the bottom substrate) and the radiating element on the top substrate. 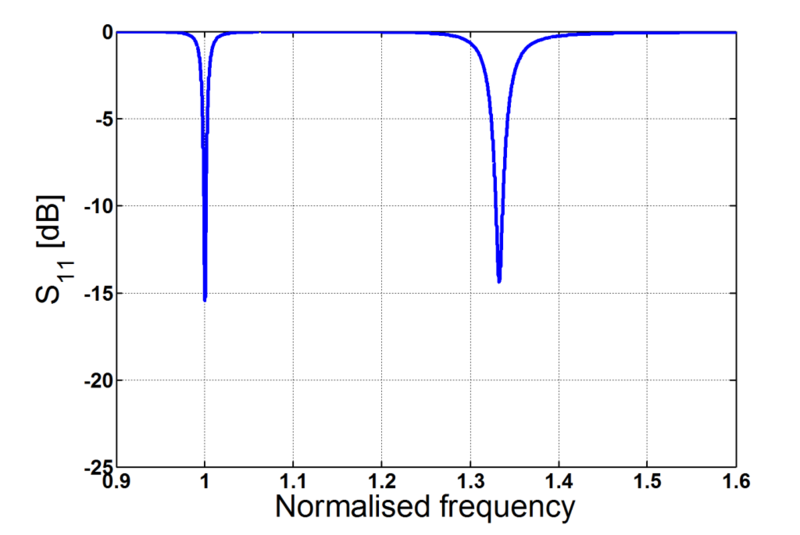 For some applications, active components (like phase shifters and amplifiers) can been integrated on the bottom substrate. In Antenna Magus this antenna can be designed for specific bandwidth. The achievable bandwidth is mainly dependant on the thickness of the substrates used. This is illustrated in the following S11 graph image. 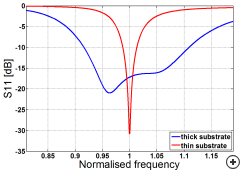 Typical S11 for thick and thin substrates. 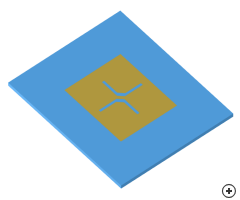 Image of the Dualband bent slot loaded patch antenna. This compact planar antenna supports TM01 and TM10 modes on the patch structure due to the introduction of slots, resulting in dual-band operation. 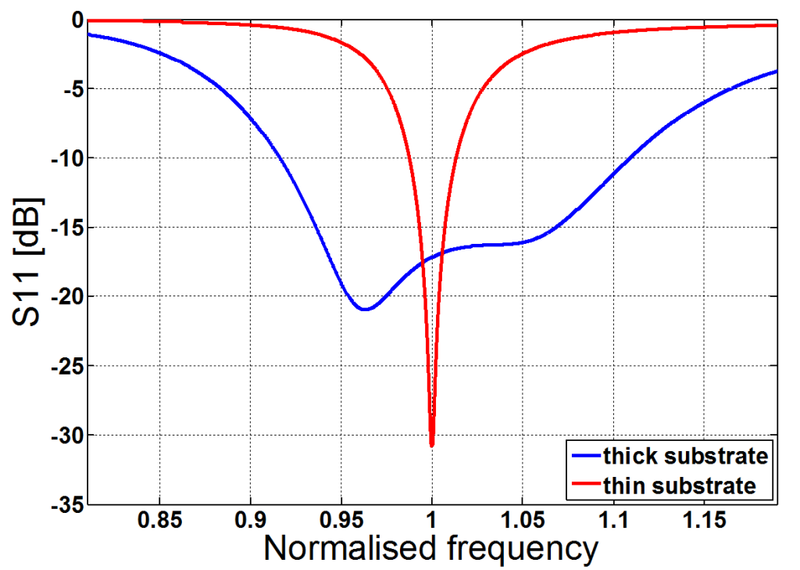 The ratio between the upper and lower frequencies is mainly controlled by the length to width (aspect) ratio of the patch. The radiation patterns at the two operating frequencies are similar in shape but are orthogonal with respect to one another. S11 showing the two resonances of the bent slot-loaded patch. 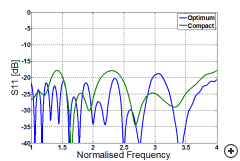 Typical total gain pattern at the lower (f1) and upper (f2) operating frequency. 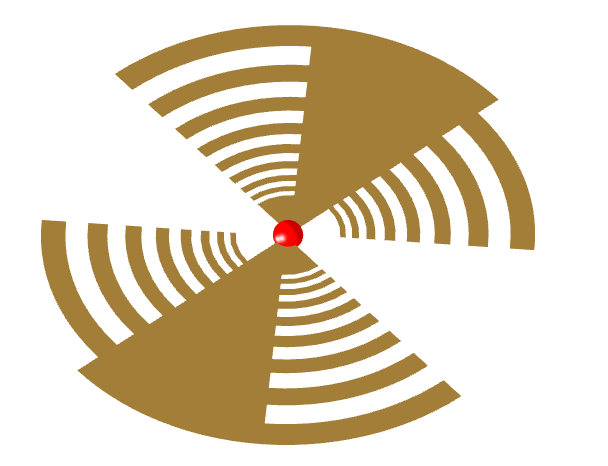 Image of the 2-Arm planar log-periodic antenna. 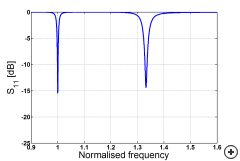 Printed log-periodic antennas typically have 2, 4 or 8 arms. This 2-arm version included in Antenna Magus is the forerunner of the well-known LPDA antenna. It is linearly polarized, contrary to its circularly polarized 4-arm counterpart. 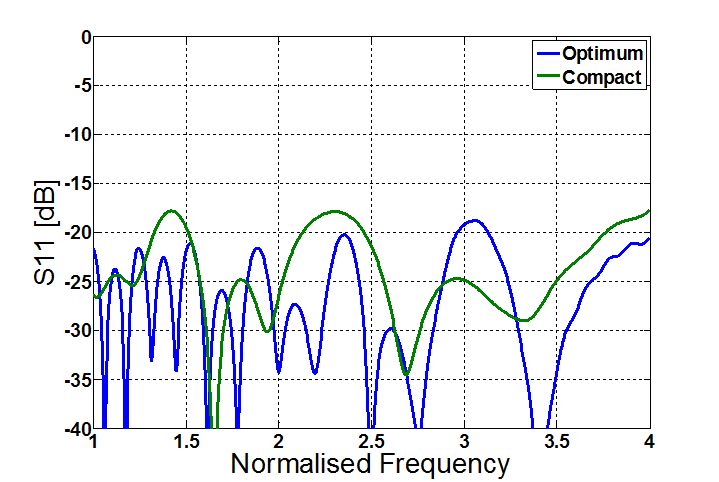 The graph below shows the typical reflection coefficient performance versus frequency for two designs: optimum vs compact with reference impedances of 188 Ohm and 150 Ohm respectively. This antenna typically operates over a wide bandwidth of 10:1 with approx. 5 dBi gain across the band. Typical S11 comparison for optimum vs compact designs. Image of the Turnstile antenna. The inclined-arm turnstile is a fairly compact, lightweight and sturdy antenna used in a variety of applications, including satellite communications. 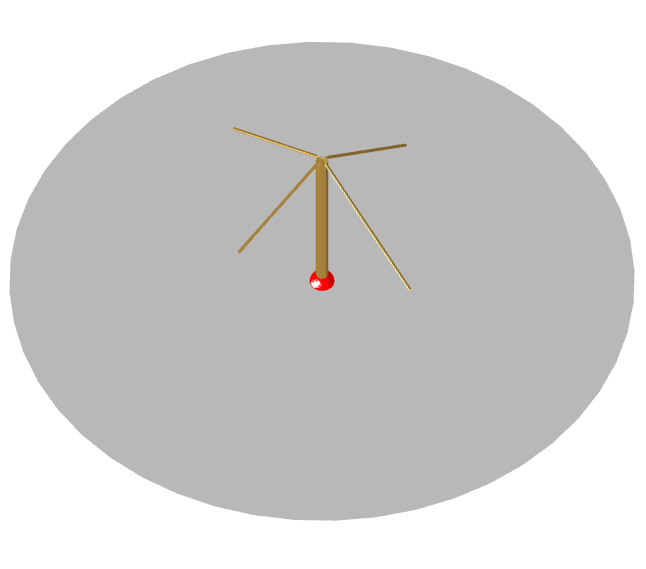 A pair of crossed dipoles, fed in phase-quadrature (using a split coaxial balun), is placed above a ground plane to achieve circular polarisation. 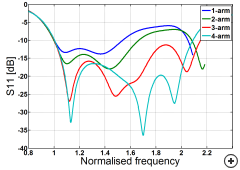 The antenna has a unidirectional pattern with a typical gain of 7 dBi and performance bandwidth of 15%. 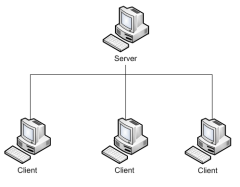 Floating (Network) licence server and nodes illustration. 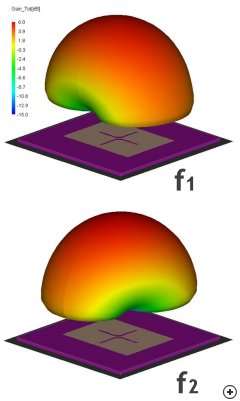 In addition to Node-locked or machine-specific licences, Antenna Magus offers Floating (or network) licences which allow Antenna Magus to be installed on many computers connected to a LAN. A single purchased floating licence allows two users to run Antenna Magus concurrently on any computer connected to the LAN. Floating licences also allow Antenna Magus to be accessed via remote desktop. The addition of this option will help users who find node-locked licensing inconvenient. Please contact your reseller to find out more about the pricing and availability of this licensing option. Still more in Antenna Magus 3.0! This newsletter only contains the highlights of the 3.0 release. There are many improvements that are made to existing algorithms and models in each release. Please keep your Antenna Magus installation up to date, to avoid being frustrated by using an algorithm or model that has been updated or improved. Please go to www.antennamagus.com/release-notes.php for a detailed list of all the changes in this release. 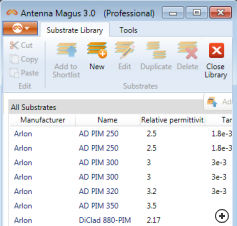 With the release of Version 3.0, Antenna Magus becomes an even more integral part of the antenna designers arsenal, assisting with their daily tasks while helping capture and manage information in a consistent and well-structured way. Over the next few months we will be releasing regular updates of the database, with interesting new antennas and transitions while expanding the utility options in the Magus toolbox.